Ros and I had a banding session at the Karori Cemetery this morning and although we didn't catch a lot we did get some interesting birds. Unfortunately the day was a bit on the windy side and so this, as well the bright sun, affected a couple of the nets. In all we only caught 7 birds of 3 species with 4 new and 3 recaptures. Blackbirds were the most numerous with 3 new and 1 recap that had been banded June 09, so a reasonably old bird. We caught 2 Tui recaps and both had been banded about a year ago. There were a good number of Tui about and it was surprising we didn't catch some new birds. Also 3 colour banded birds were seen. One was banded June 09, 1 on June 10 and the other unfortunately has lost a band and is now W-R/M so can't be positively identified, but the most likely bird is B/W-R/M which was banded in May 04 and occupied the same territory up until this bird appeared with the missing band. The highlight of the morning was catching a male Bellbird the first we have caught for several years. We also identified a colour banded Bellbird which is almost certainly from Zealandia. The male Bellbird, a handsome chap who now has some new bling. The catch rate from this part of the Cemetery has dropped noticeably since most of the Dogwood trees were poisoned about 3 years ago. They now have bare branches where they were previously loaded with fruit at this time of year. Two of our group (Annette & Nikki) have just returned from the Chatham Islands where they were helping Tansy (who did some training with us recently) with the black robin post-breeding census and banding of this year’s juveniles. Almost, (there is at least 1 that is not), all Black Robins are colour banded with individual combos that include a year colour. Most of the Robins are caught in Clap Traps baited with mealworms which are irresistible to most of them, but they are also very tempting for the local Chatham Is Tomtits. Black Robin in the "Catch Zone" Sorry the pic is on it's side , I can't seem to correct it. Chatham Is Tomtit with it's free meal. 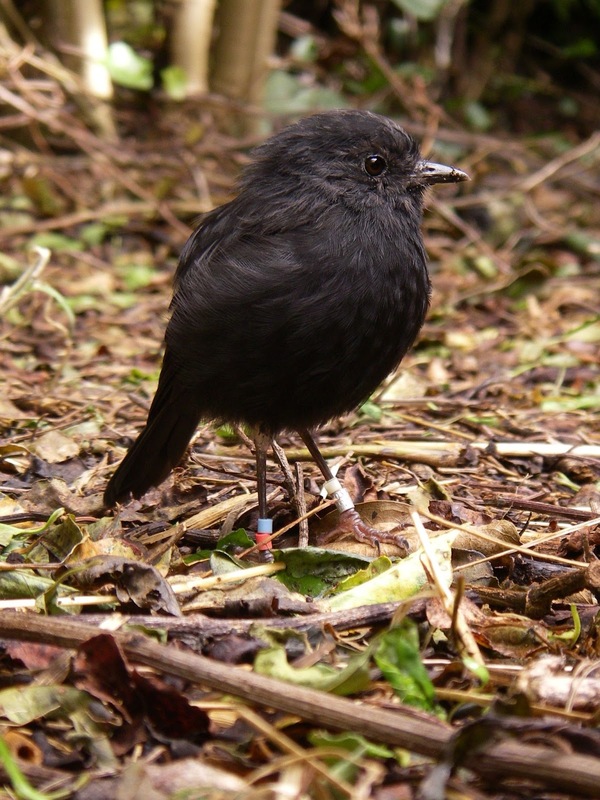 Fifty Five robins were found on Mangere Island – 45 banded adults and 10 juveniles that were caught and banded. The "Robin Bush" on Mangere Is is a very small patch of green on a big rock called an Island. The bush area is much larger on Rangatira Island, and 195 adults and 91 juveniles were found. 100 of these were unbanded. They caught and banded 99, but despite much attention could not get number 100 which was not interested in mealworms, and she remains unbanded. There might be a few more birds on Rangatira that managed to avoid them on this trip. As these are the only two places where Black Robins are found the total world population in April 2013 is about 341: at least 240 adults and 101 juveniles. All these are descendants of just a handful of birds including just the one female, Old Blue who saved the species from extinction. The oldest bird found on the trip was a female G/A-G/G that was banded in 2005, unfortunately last year's oldest bird, which was 13 years old, fledged last century and was banded by the late Don Merton was not seen this year and is presumed not to have survived. We had a reasonably successful day's banding at the Zoo today. We had good conditions, especially this morning, calm and overcast then a little light misty drizzle early afternoon and later some rain as we packed up the final net. In all we caught 76 birds of 7 species with 61 new and 15 recaptures. A good balance of banders attended with several experienced ones ably to assist and mentor some new folk. Some of the team (Gen, Annette, Otis & Ros) busy at the banding station. Greenfinch - 6 (1) The recap was banded in July 11. The overall total was well below the usual for this time of year. Silvereye - 28 (9) We had 3 birds caught in a net at the same time that were all banded on the 27 May 2012, 2 with consecutive numbers. One of the other recaps was banded at the Mt Albert site last month. One of the Silvereyes also had a prominent growth bar. Gen with "her" Tui, amazingly she got it out of the net on her own without spilling any of her blood. Surprisingly we didn't catch any Blackbird but we had a bonus in a keeper reporting the recovery of one found dead recently. 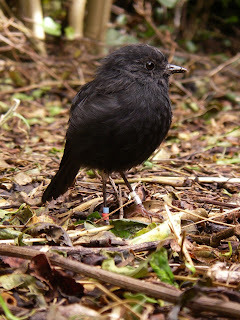 It had been banded in Nov 2005 so at 2666 days from banding, although not our oldest Blackbird still a pretty old bird. This highlights one of the benefits of banding at the Zoo with staff reporting recoveries as well as assisting in other ways, their help is much appreciated. Although it was grey and cloudy when I was setting the nets up the sun did come out, but the real Grey was a huge number of Grey Warblers caught. In all there were 17, which is an incredible number of these little beauties. In the first hour 13 were caught and the only others birds were 3 Silvereyes and a H Sparrow. This is the most Grey Warblers I have ever caught in a day. I think the previous biggest number was 10. In all 37 birds of 7 species were caught with 33 new and just 4 recaps. Grey Warbler - 14 (3 ) all the recaps were banded in the last few months. Only 2 birds had the red eye of an adult all the rest were young birds with brownish eyes. Kingfisher - 1 (0) This is only the 2nd Kingfisher caught at this site in over 5 years. In the last 12 months the only Kingfisher was caught on the last banding session for the year, and in this period 1 has been caught on the first session. The first Kingfisher for the year, hopefully not the last. It was an average years banding in the year 1 April 12 to 31 March 13 which is the DOC Banding Office banding year. In all for the year we banded 2993 birds of 16 species which is slightly above the 8 year average and slightly below the 5 year average. Below are numbers caught for the 8 years since the Banding Office altered the year to run from April to March. The last 4 years show the ranking for each species. The number of each species that were recaptured in each of the last 3 years. This number includes, in many cases, the multiple recaps of the same bird. No 1 Silvereye - 1063 (621) Has been the No 1 species each year but this year's numbers are well below the average with a big drop at several sites. No 2 House Sparrow - 905 (148) Usually at No 2 and well above the average with a very big breeding season and large numbers of juvenile birds caught. No 3 Greenfinch - 197 (55) our lowest tally for 7 years. The drop in numbers was evident at all our sites so there appeared to be fewer Greenfinch around the city. This species is usually at 3rd but has been ahead of Sparrows in a couple of years. No 4 Chaffinch - 175 (23) usually at 4 or 5 on the list and slightly above average. No 5 Blackbird - 151 (71) also slightly up on the average. No 6 Goldfinch - 140 (3) the big mover for the year and by far our highest tally. A large number of juveniles were caught at our stream sites and these will hopefully show up in the recapture figures over the next 5 years or so. No 7 Starling - 91 (23) pretty close to the average for new birds but a very good recapture rate. No 8 Tui - 71 (10) with the exception of 07/08 when we targeted Tui one of our highest tallies. No 9 Dunnock - (13) after a big drop in numbers last year well above the average. No 10 Fantail - 60 (10) above average but numbers fluctuate a lot depending on the winter survival. No 11 Grey Warbler - 39 (11) lower than last year but still above the average. No 12 Yellowhammer - 27 (0) another species that fluctuates a lot with catches fluctuating depending on where they feed during the winter and the catch ability of the site. It was a bit disappointing not to get any recaps. No 14 Eastern Rosella - 2 (0) a bycatch at the Karori Cemetery site but we did have 2 bounce at other sites. I expect this species to feature more in the future. No 15 Kingfisher - 1 (0) a bird caught on the last banding day of the year. No 16 Redpoll - 1 (0) a large flock fed at MacAlister Park last winter but we were unable to catch any. The oldest bird recaptured or recovered for each species. Species in red are from this last year. The number of birds that were recaptured or recovered that were over 5 years from banding for the last 2 years. It is good to see that several species have had a substantial increase in the oldest bird category and also an increase in the number of birds caught over 5 years from banding. I had a quick look at the cause of death for birds this year and by far the majority were cause unknown including 1 that was reported as "having just fallen out of its tree". 1 was killed in a rat trap, 2 from the Zoo were killed by Otters, 3 hit windows, 5 were killed in road accidents and 9 reportedly were killed by cats.